Nothing is more exciting than designing a space from scratch! I’m a lucky girl: this project is a finished garage that had been used as a woodshop by the previous owner. My friend wants to turn it into a space where her very active 6-year old daughter could burn off some energy. The space is perfect: square, open, high ceiling with exposed beams and a skylight, two sets of double doors to the patio that let in tons of light. The blank wall was begging to become a climbing wall, but they also needed space for mom to chill out while daughter was being busy, and an area for some quiet activities. The last thing I wanted was for this space to look and feel like a gym! Where to begin? For me, it was a quart of lime green paint that they had bought but never used. It made me think of this Marimekko fabric, which became my inspiration piece. The wheels turn, the pencil draws, erases, draws some more, and I do seemingly endless research online, and VIOLA! A fun, functional, yet stylish play room with 12′ climbing wall, monkey bars, trampoline, art wall framed by birch tree wall decals, reading loft, homework area, and a loveseat for mama. I present my boards, samples, and budget to my client, we work through the details and make adjustments. 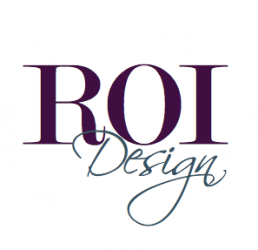 Copies of the concept board and drawings, along with product spec sheets, resource guide, timeline for completing the project and an itemized budget, all get neatly organized in a nifty binder for easy reference. And that’s what you get in a DIY Design Guidebook. For this project, I’m providing execution and installation services as well, so I will have more fun things to show you in a month or so! I’m working with a client who shares a common problem with many families in urban areas — a small master bedroom without much natural light. Here are 5 bedroom decorating tips to avoid feeling like you sleep in a cave. 1. 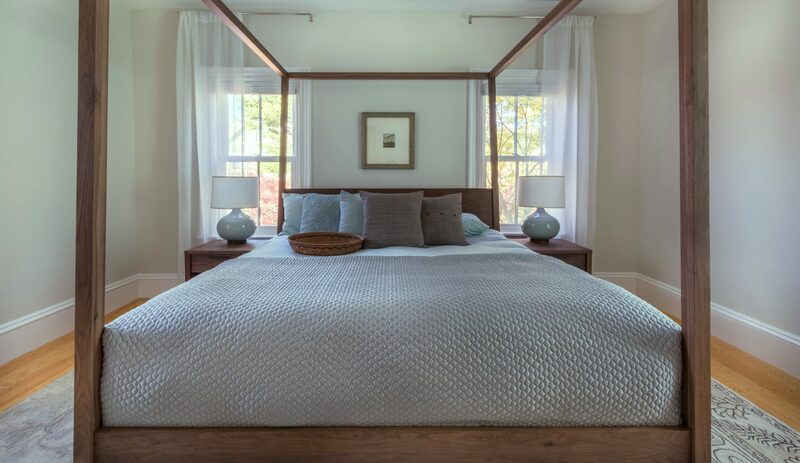 Keep it simple: cream walls paired with white bedding & window treatments. 2. Soft, gold-toned walls that mimic sunlight. Like the room above, the dark furniture keeps the room grounded and sophisticated. 3. Defy common sense and go dark, but keep the rest of the room light. 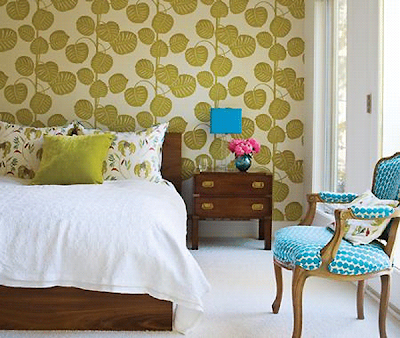 The quirky, vintage furnishings and graphic coverlet have enough character to stand up to the strong color. 4. Patterned wallpaper, but not so busy it isn’t restful. My rule of thumb: Imagine waking up with a hangover. If the mere suggestion gives you a headache, tone it down. 5. And finally, my favorite design route: take the walls to the bright side. Only for the brazen who are not afraid of color. Here’s what I chose for my own bedroom walls. In addition to being small, my bedroom does not get much natural light. This orange is warm, cozy and inviting. When I use an intense color like this in a small space, I go with a satin or eggshell finish, so that the walls reflect the light, rather than absorb it. I just discovered Olioboard, an online moodboard creator. I started playing around with it yesterday, and got sucked in for an hour. What do you think? For this board, I started with the chair and the trio of bookcases, and wanted to add some fun color and whimsical florals for a feminine touch. The metallic mirror, side table, and lamp keep it contemporary, while the stone fireplace adds texture and brings us back to nature. If this were real life, I’d paint the walls a warm gray — Ben Moore’s revere pewter is my go-to neutral lately. I also signed up for floorplanner.com, and am thinking I’ll use these tools for client projects. What online tools do you use and love? I had a lot of fun designing my first kitchen project. There is a level of detail in designing kitchens that is dizzying, but the most critical part is the floor plan. I picture myself using the space, cooking, cleaning, entertaining, and the design flows from there. This condo is on the third floor of a three family house, about 900 sq. ft. The renovation completely transformed an awkward, dark space into a light-filled, functional room. The budget was tight, since the bulk of it went towards the construction work to vault the ceiling. So I went with only 4 pieces of stock cabinetry, chose good-looking but mid-range appliances, and selected remnants for the marble countertops. 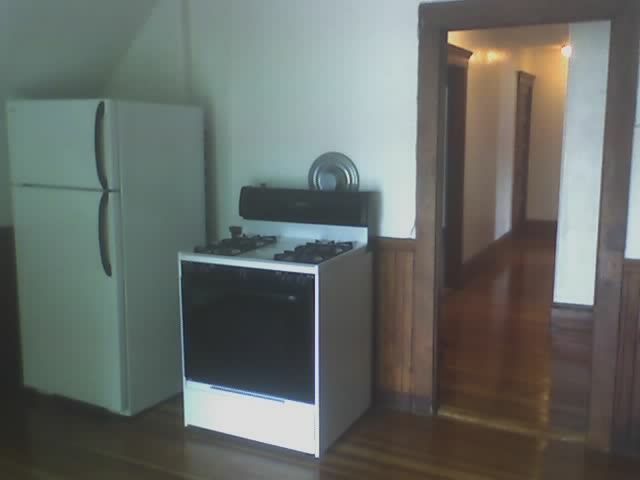 the original kitchen: no countertops, cabinets, or storage whatsoever. 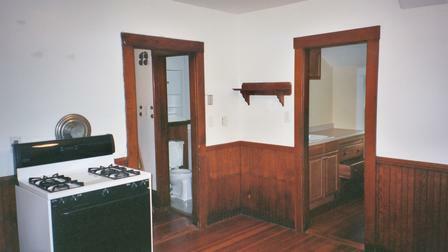 the tiny separate pantry housed the kitchen sink. sliders to deck. the roof over the deck and low ceilings made the kitchen feel small and dark. 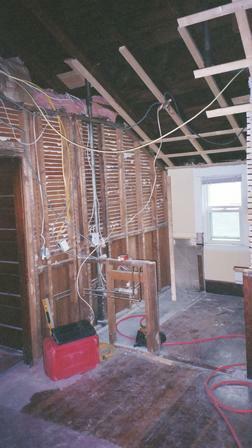 the pantry wall and ceiling were demolished to open up the space. 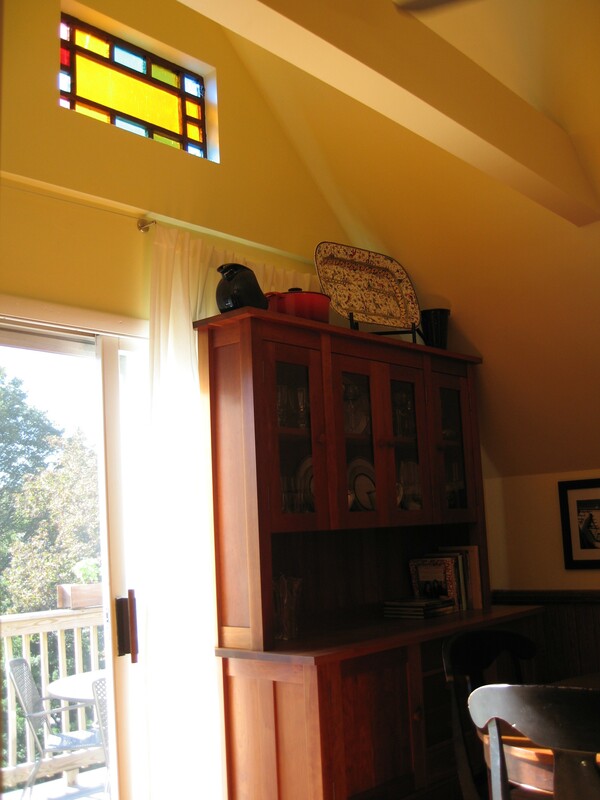 opening up the ceiling to the roofline exposed the home's original stained glass window. 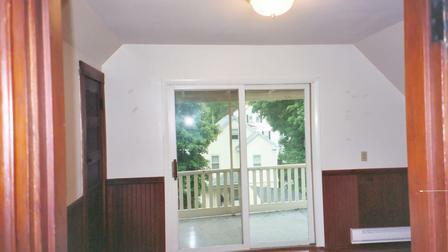 the original beadboard and wood trim was stripped and given and clear coat of polyurethane. 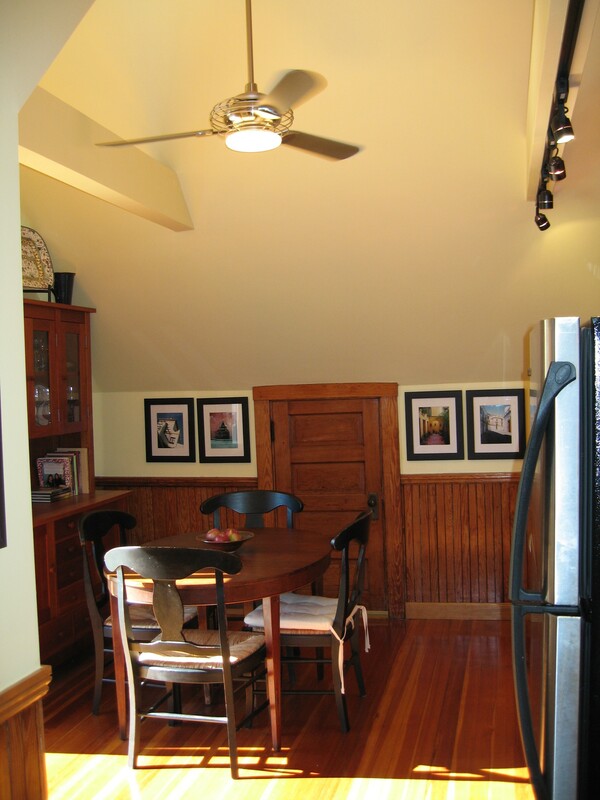 the family's own shaker-style hutch and farmhouse chairs are a nice juxtaposition to the modern lighting, stainless steel, and vaulted ceiling. 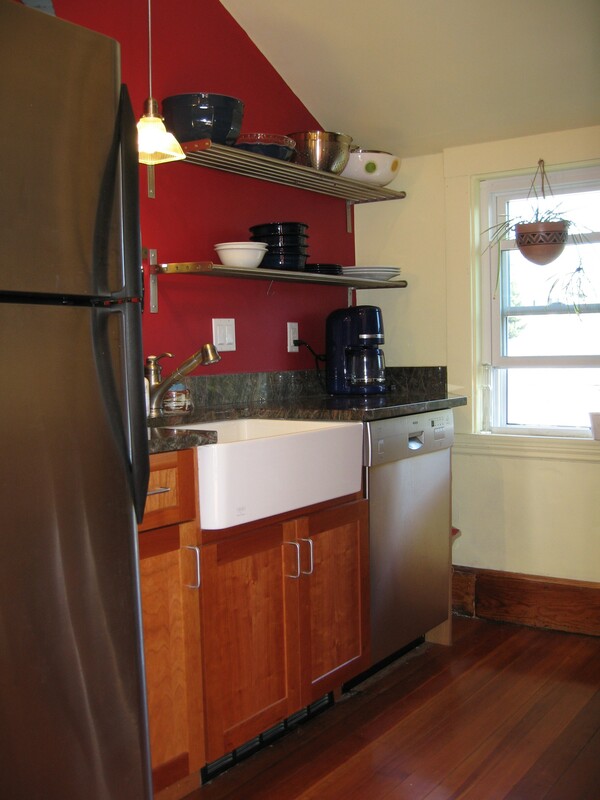 we selected KraftMaid cherry cabinets, rainforest green marble counters from Gerrity Stone, porcelain farmer sink, and simple open shelves from IKEA for the former pantry. the slanted ceiling posed a challenge for upper cabinets, but the wall-mounted pot rack and spice shelves keep the space feeling open. 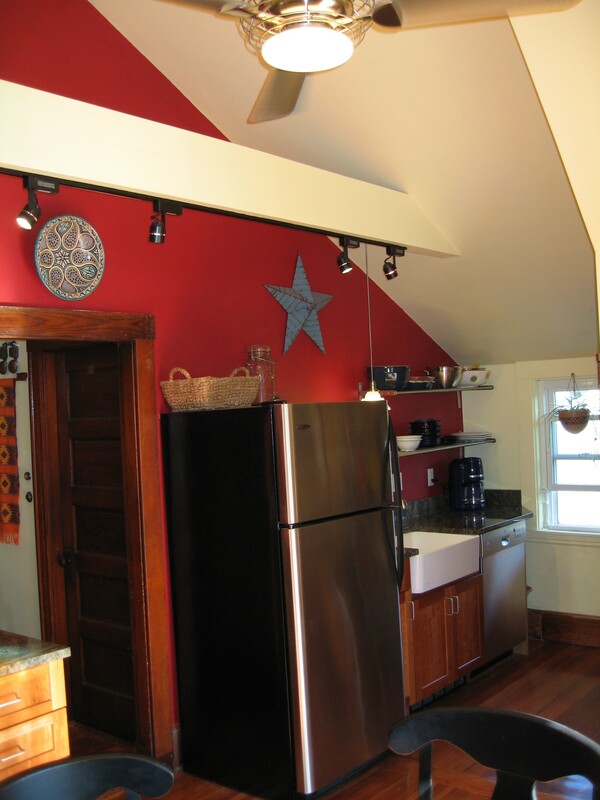 beams that were added to support the roof provided the perfect spot for task lighting. 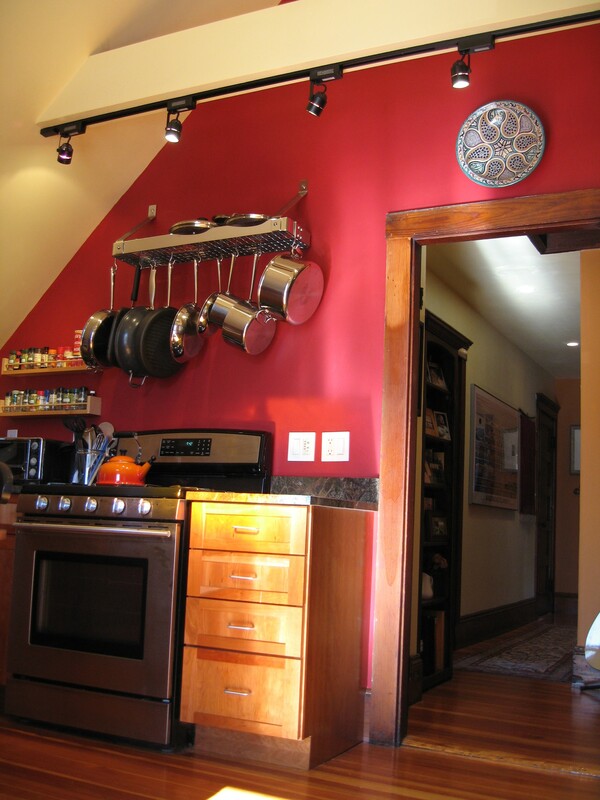 benjamin moore's moonlight 2020-60 on walls, ceiling, and beams, and a custom-blended red accent wall give the room a lively and eclectic feel. Appliances, plumbing fixtures, lighting – Yale Appliance + Lighting, Dorchester, MA. They also service everything they sell.